Certain that, like us, you're deeply engrained in the bacchanalian traditions of the Christmas holidays, we thought it high time for a little juxtaposition, hence, Texas Microphone Massacre. Though nothing quite says "Merry Christmas!" 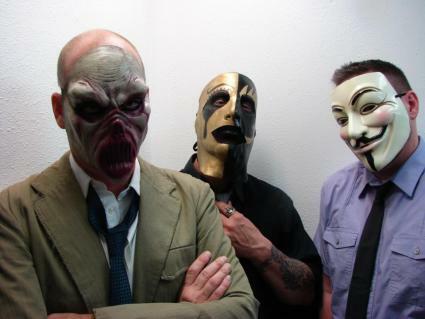 like a trio of masked, psychopathic-looking individuals with the word "Massacre" floating around in there, the music these guys generate is nothing short of mind-blowingly great, if in an occasionally-morbid way. That, and their first release, "Fantasy Rolodex", composed and performed under the watchful eyes of Grammy-award-winning producer Tim Gerron, is still a freebie. Get it yonder ways.